4. Next you will be prompted to select from three different web mail applications; Horde, RoundCube and SquirrelMail. 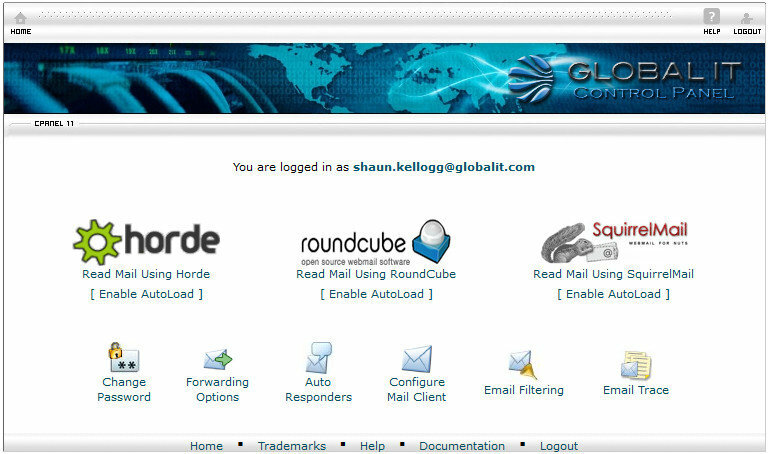 Horde, RoundCube and SquirrelMail are three webmail applications available to every Global IT client. Each has a different interface and set of features, but they all access the same mailbox. Horde may have the most features: a mobile device interface; calendar and task organizer, custom filters; along with the ability to share content with others. RoundCube and SquirrelMail are more streamlined with fewer features and both are easy to use as well. We encourage our clients to experiment with each application and find that one that suits their needs. After you have selected your webmail application you are ready to read and send e-mail from your webmail portal.